Our foxy visitor has a name, and he shares it with Blaise on Chapter 9 Page 11. Blaise finally makes the connection as to what it is that he is talking to. 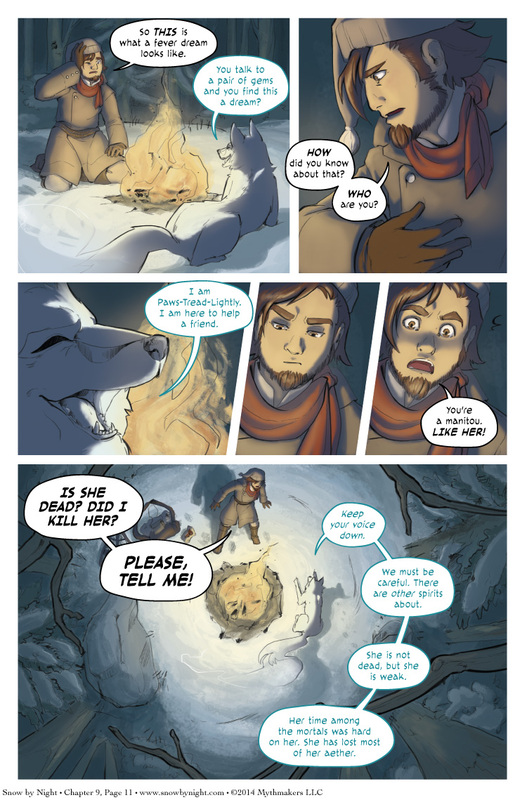 To see a peak at the next page, please vote for Snow by Night on Top Web Comics. We’ll be posting another Almanac entry tomorrow night. You might like this entry. It discusses the Malignant Spirits that spread contagion through the world of Corthis. On Friday, we’ll be uploading a surprise. Yes, one would not want to draw the Crow’s attention to the current situation. I don’t know if any of you also read Widdershins (http://www.widdershinscomic.com/), but M. Dansereau’s new friend does bear a certain similarity to a character in the current episode. So, not entirely sure he should completely trust the cute little doggy. What was the name of this chapter again? I know that Widdershins exists, but that’s about it. I haven’t had time to keep up with any webcomics lately.